The Eder Strahltechnik test center team consists of three people (one trainer, one technician and one assistant in charge of the test center). The team is on hand to offer their experience in technical support, trials and training. In 2011, 5 seminars were organized within the test center and 9 directly on customers' sites, representing training for a total of 48 Eder Strahltechnik partners and customers. Eder Strahltechnik test center offers customers a total of 6 blasting facilities. 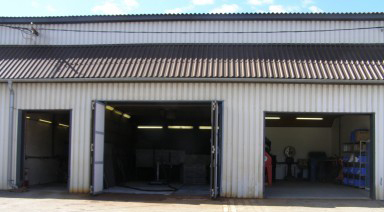 1 air blasting room with all levels of pressure, nozzles (rotating), hoses etc. 1 specially designed machine for steel plates of different sizes to simulate blasting with different speeds, nozzles, angles, pressure, distance and abrasives. 1 wheel machine and 3 air blast cabins. The test center is not only a place where blasting tests can be carried out for customers, but also one where customers can learn, thanks to our expertise, many things about the air blast process (e.g. pressure loss in different hose diameters in situations with different air and abrasive flows, the correct abrasive flow for different metallic grit or other abrasive sizes and pressures in relation to various nozzle sizes etc. ).